Don’t let being vegetarian or vegan put you off enjoying your summer evenings around a barbecue. 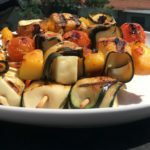 Whether the whole family is vegetarian, or you are catering for a handful of vegetarians in a larger group, our ideas will ensure everyone wants to try your meat free options! Please note that our barbecues will be thoroughly cleaned before this class, but they will have been used for meat and fish previously.